It’s been four months since I got my colors “done“; time for an update! I’m settling into this new season; I see when my face “pops” with a good color; I can now see plainly that a few old pieces I initially thought were Light Summer are not; and it’s becoming a lot easier for me to pick out some of the Light Summer colors at a glance (I then confirm with my handy dandy color palette). Can you tell I’m having fun with this? Pop! As always, take photos of the palette with a large grain of salt due to lighting etc. I thrifted these Bermuda shorts even though they’re more where my style 8 was years ago. I couldn’t help myself – they were so perfectly Light Summer. That’s actually been a challenge – it’s still novel and exciting for me to find something that’s a perfect palette match that I sometimes buy things I normally wouldn’t because IT IS MY PALETTE. Working on that. Amazingly, I’ve even had success finding my colors online, which can be a tricky proposition since lighting and monitor settings affect things. Knowing it’s hard to match colors in some ways makes me more restrained – I’m less likely to buy something unless I’ve seen it in person. Glorious. 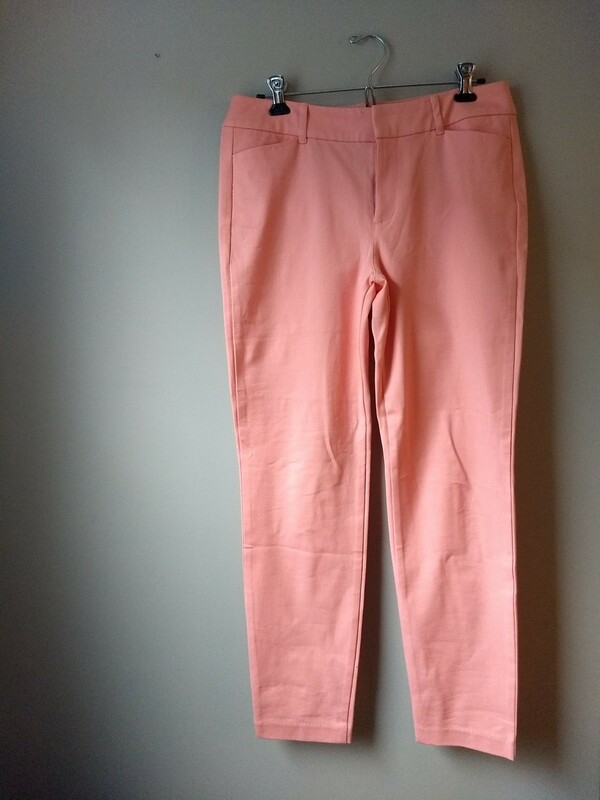 The Pixie pant from Old Navy via Poshmark. Also Pixies from Old Navy via Poshmark. As far as denim goes, I’ve been happy to stick with my darker Paige jeans because we so easily read jeans as a neutral; plus pants are far from the face, where it’s most obvious if you’re wearing something outside your palette. 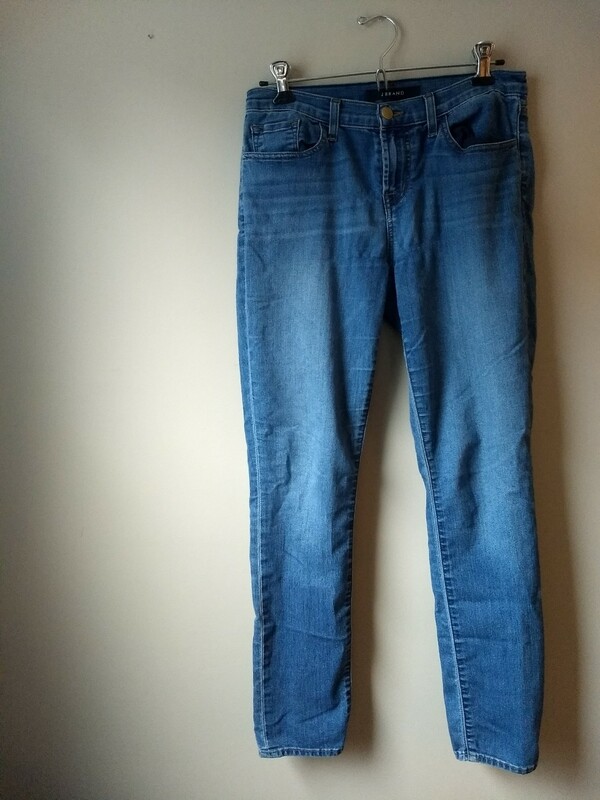 And I had found some “Best Girlfriend” jeans that were right in my color palette; but they are baggy, weekend, laze-around-the-house jeans that don’t give the cleaner silhouette I like for more polished outfits. They’re a tiny bit cropped but since I plan to wear them now through fall, that should work just fine. I think I mentioned before that this palette made me realize that I had let myself get seduced by the neutral-heavy palette of minimalist Instagram style mavens. Although there’s a lot to be said for playing with texture and silhouette within a very muted, narrow palette, I came to recognize it just didn’t feel like me. (One of my favorite shirts is bright blue snake print, for Pete’s sake!) When I posted a muted peach skirt on Instagram asking for color suggestions to dye it, someone suggested “rust!” with enthusiasm and I just wanted to run the other way. It’s been a breath of fresh air leaning back into color with this new color palette and embracing PATTERN beyond just a neutral stripe or dot. (Can you tell how happy those floral pants make me?) I’m excited to share more with you as I finish building my spring/summer wardrobe – whenever spring finally arrives!! 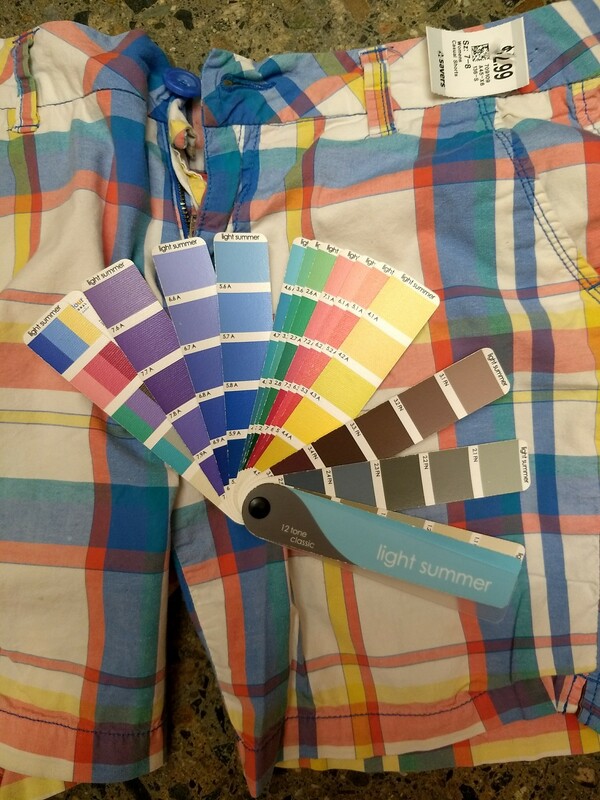 It’s neat that you’ve come to recognize a good color on you after learning to pick out the light summers. 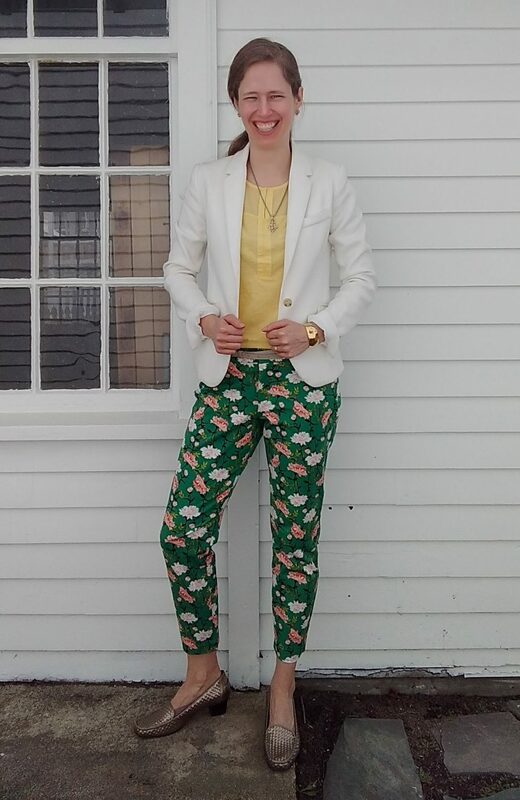 Yep, you’re lovin’ those floral pants, and they do look good on you! 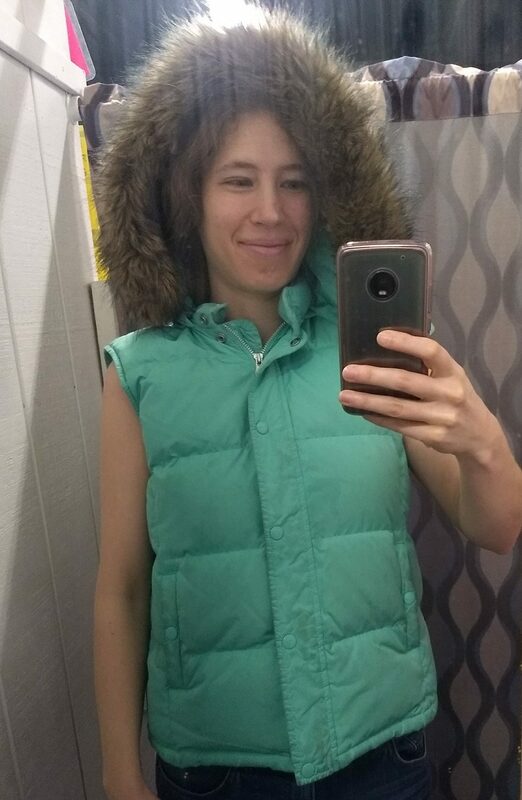 I’m also a light summer thrifter. Do you ever buy things outside of your palette? If I see something that’s a pretty color, current, fits, is a great brand at a good price I’m all over it! I have no discipline! What color/colors do you use as your basic neutral? Hey Lily, I have tried *really* hard since I got my personal color analysis (PCA) done in December to not thrift outside my color palette – partly because I spent good money on the PCA and I want it to be a good investment, partly because I know how good “my” colors make me look! I’ve also been thrifting for so long that I know if I’m patient I’ll find JUST the right piece instead of something that’s almost perfect but not. But I don’t think there’s anything wrong with nabbing stuff you love and will wear – it’s such an individual thing! My neutrals tend to be denim, Light Summer white, and gray (there’s more wiggle room there since a lot of grays work for Light Summer). I have a dress and one pair of pants that are kind of in “stone” territory. You look VIBRANT in “your colors” and are a great inspiration! I have determined (without professional help) that I am a combination of “Soft Summer” and “Soft Autumn” (if there is such a thing!) and am now looking for muted versions of the clear colors I always purchased. Thank goodness for thrifting since without it, we are at the mercy the the color palette that just happens to be “in” this season! p.s. – I’m also suddenly into florals! What fun! I bet you probably tend towards one or the other of the Soft seasons, but since most seasons can “borrow” a bit from one of their neighbors, it sounds like you’re finding the right combination that works for you. Can’t wait to hear what it’s like for you shifting from clear to muted! Thank goodness for thrifting indeed. 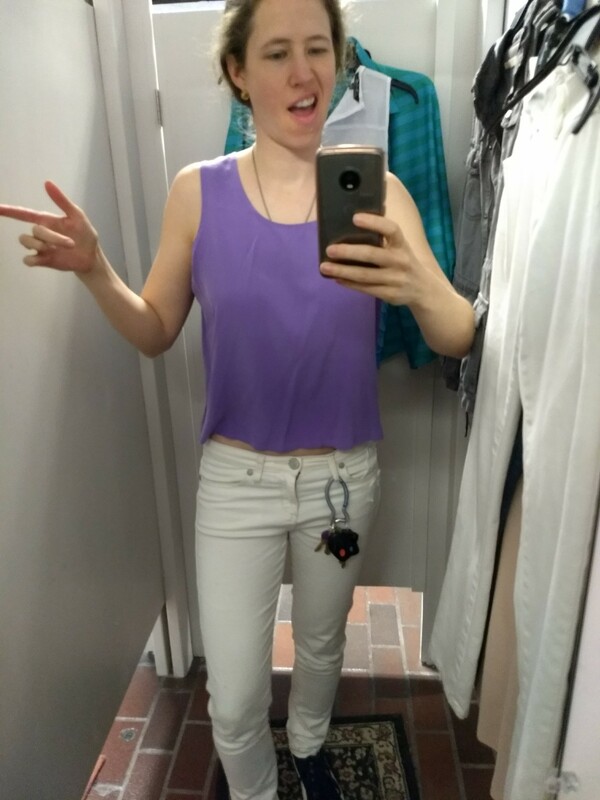 I’d be pretty much naked if I had to rely on retail stores for consistent Light Summer colors in my size/style! And YES to florals, they can be so much FUN when done right (which for me is somewhat bold, can you tell?). Glad you enjoyed, Nicole – good luck in your LS quest!